"Never become desperate enough to trust the untrustworthy." Synopsis: Ahsoka Tano has no choice but to flee the surface of Coruscant - evading pursuing clone troopers by journeying into the dangerous depths of the city-planet. The long arm of the law extends even to undercity and time is running out for Ahsoka to prove her innocence. Great episode. 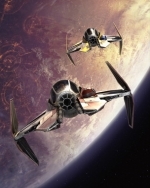 Loved seeing the armored Coruscant underworld cops, the TIE gunship, the chase, the fights, the doublecrossing. Argh, I need to watch the final episode. This had a good build up, but they had an odd choice for the traitor. This had a good build up, but they had an odd choice for the traitor. Also, the further rehabilitation of Ventress is a cool thing to see. Really frees up her character to do anything in the next season. If there is one. I guess it is up to Ventress now to reveal the true person pretending to be her behind that mask: Maul with a clever curvy disguise! The only twist left in this arc would be if Barriss was gay and did all this so she and Ahsoka could run off together. To be honest, I'm not sure if I agree with the creative direction of this arc. If they wanted to play this out in Hitchcockian fashion, they needed to allow Ahsoka to actually discover something to help her cause. She's now further off the trail than she was at the start. It makes a very powerful moment at the end of the second episode ("now you have to trust me") feel hollow. Now for half of next week's episode we're going to get a cliched mock trial where the dialogue is going to be a bit of a rehash of what took place during the second part of the arc. I hope I'm wrong, but it seems the conclusion will be predictable: Anakin will find out who was behind the plot with the help of Ventress while Ahsoka sits in court defending herself. At the very last minute, before the hammer comes down on Ahsoka there will be a climax that reveals the true traitor. If it turns out to be Barriss, they better have Luminara on the next episode. Sorry to bump a really old thread but any chance someone could re-up this episode? Just working my way through my clone wars backlog and this ep has been corrupted on my NAS and it sounds like it's been a classic that I'd hate to miss. Totally primed for the last episode of this arc/season. This episode wasn't as awesome as the last but I still thoroughly enjoyed its unique twists and turns. By the way, during the brief chase on the subway, there was this one particularly lengthy and exhilarating shot (gotta point these out) of Ahsoka making her way toward the back of the train via a series of flips and jumps. I also loved how dingy the subway train looked. Reminded me of the end of Batman Begins. Barris seems to be too obvious choice right now. I see no way she would suddenly become evil and be more powerful than Ahsoka (force choke through a wall, killing off dozens of clones). Anyway, I loved this episode for bringing back a more gritty world into play once again. It seems that all the new stuff is designed to fit with the game 1313. Indeed, also, the action takes place on levels 1312 and 1315. Nice nod to the upcoming game. Barris seems to be too obvious choice right now. I really want to be surprised, but she pretty much fits the bill. In the Featurette for this episode, Filoni implied that the identity of the killer was obvious to those paying attention. I’m now wondering if Bariss is aligned with Palpatine or Dooku. 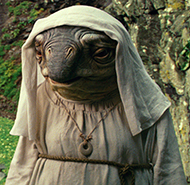 It’s also possible that the Geonosis brain worm permanently corrupted her mind. This all makes Ahsoka’s decision to spare Bariss' life in “Brain Invaders” more interesting. It seems to parallel Obi-wan’s decision to spare to Anakin on Mustafar. Now they really need to put Luminara on the next episode. I would like to see her reaction to all this. Oh wow, what happened to keeping things a secret until AFTER the episode? The preview they have there isn't the same any more. 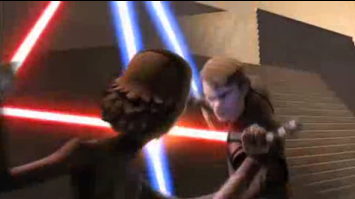 It used to have a preview that showed a short (<5s) clip of Anakin fighting what appeared to be Barriss. The picture above is as clear as it ever got. Heh, I guess that's what Filoni was talking about in this interview. Seems like the unaltered version got accidentally released! Hey, never question the ability of our fans to catch the details. The smallest thing, the smallest problems -- if a padawan braid is on the wrong side of the head in one shot, for one frame, they will catch it. 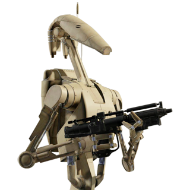 We were just watching a trailer of something we’re going to put out for Clone Wars, and I was like, “Oh, see that there? That would give something away.” They’re like, “But it’s two frames!” I’m like, “No. No, trust me. They’ll see it. The fans will see it. They know. The Star Wars fans are the best, most accurate. They will find it out.” And I love it. Tim Curry is the actor replacing Ian Abercombie as Palpatine/Darth Sidious. Tim Curry of Home Alone 2 fame? Tim Curry as Palpatine in the newest preview. He sounds terrible and didn't even make an attempt to sound like Palpatine. Yikes. Check it out - He's Tim Curry, doing Ian Abercrombie, doing Ian McDiarmid, playing the emperor. For the minimal number of Palpatine episodes likely left in this series, they couldn't have given McDiarmid a phat wad to call in a performance over the phone? Hell, they couldn't have had Witwer take over? His Sidious is pretty good, and I can't believe his Palpatine would have been worse than Curry's. Looks like it's a poor choice. Kelsey Grammer might have done a much better job. Daniel Davis recorded the audiobook of the Darth Plagueis novel. He would have done a good job. For the minimal number of Palpatine episodes likely left in this series, they couldn't have given McDiarmid a phat wad to call in a performance over the phone? I've thought about that, assuming there is one or two seasons left (and Palpatine isn't even in half of those episodes).